"This is a great sandwich filling that they make at the diner in the hospital where I work, but I fancied it up a bit with some green onions and pecans. A great way to use up leftover chicken. Delicious!" Mix together the chicken and mayonnaise in a bowl, stir to coat well, then stir in the green onions, dried cranberries, apple, pecans, lime juice, salt, pepper, and dill weed. Serve immediately, or refrigerate several hours or overnight (the flavor just gets better). Use 1 tablespoon fresh chopped dill instead of the dried dill. Made this today, it was DELICIOUS. I used red onion instead on green. I will definitely make this again! 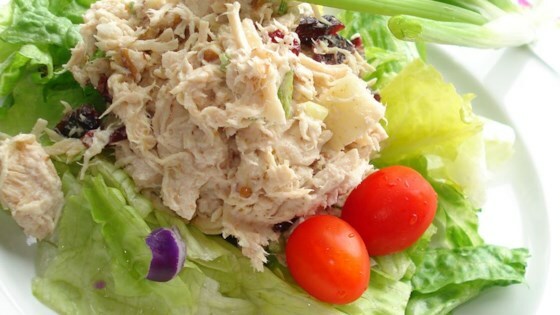 Absolutely my favorite chicken salad. I've used cranberries, cherries, even currents.... people rave about this recipe. Very tasty and satisfying dish. I think I will double the recipe next time so we have more left-overs!